I already have described in a previous blog, how to consume and read data from that Modbus module. After checking out the documentation and some testing, I found out how to write commands back to the device too. Let’s check out how we can use this in a Custom C# module. After that, we use it in an Azure Functions Module. So let’s do a deeper dive into Azure Functions on the IoT Edge as well. In my last blog, I show how you can implement SignalR on a website running Asp.Net MVC Core. Although the libraries are still in Alpha, the functionality looks very promising. In this blog, I will show you how you can pass data on to the website so it can be shown in the browser. Users will ‘instantly’ see updates coming on the website. Update March 28, 2018: a new solution structure is introduced. Follow this migration path if needed. 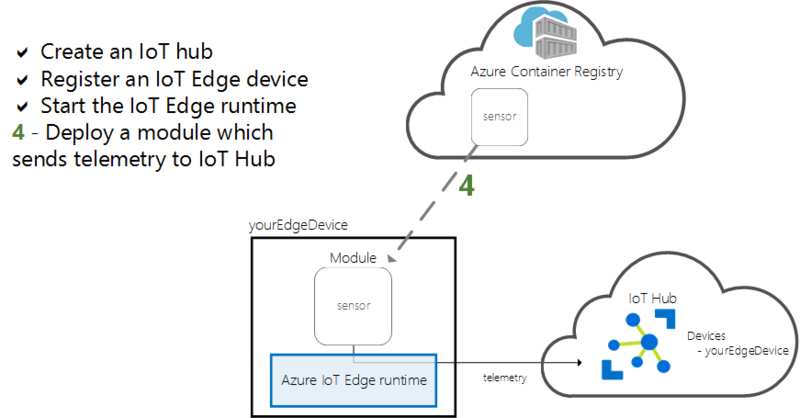 Recently, the Microsoft Azure IoT Edge platform was updated with more features, better documentation and lots of goodies. Version two is brand new and still in Public Preview. The new features and fixes are both very welcome and promising. Yes, the learning curve of this new version is steep, especially if you are new (like me) to Docker. But once you have started building your own Edge solution, things seem to fall into place quite well. But by reading the comments on the different pages, it seems people are still confused. The biggest tip is: DO NOT MIX VERSION ONE AND VERSION TWO DOCUMENTATION. Version one is/was based on one executable (gw.exe) which injects classes from DLL’s (a configuration file has to be supplied). Modules are just classes in the DLL’s. Version two is based on Docker Containers, each module is a separate container and therefore each module is a separate executable. These modules share the same logic on how to connect to a shared message bus which provides the routing of messages between the modules. This ‘runtime’ has to be installed on the Edge machine, next to/outside the Docker containers. Note: the good thing is that the architecture still stands, multiple modules on top of a message bus and messages are routed. The best thing is that the new routing solution is far more intelligent, different messages are separated from each other. And Microsoft has provided some guidance for migration for your ‘old’ modules. OK, I know, the learning curve is still steep. How about if I add an example of a simple but functional module?